The final missing piece to René Magritte’s large-scale work ‘La pose enchantée’ (‘The Enchanted Pose’) has been found after having disappeared in the early 1930s. The European Centre of Archaeometry at the University of Liège discovered the fourth and final missing portion of the painting at the Magritte Museum in Brussels. In order to economise, the Belgian surrealist used to reuse his canvases, painting over previous works or cutting up larger canvases to create several smaller ones. That’s what happened to ‘The Enchanted Pose’. The catalogued painting, dated 1927, disappeared from view five years later, and since then three parts have been discovered hidden under other paintings. The final piece – the top right section – has now been located underneath Magritte’s painting ‘Dieu N’est pas un Saint’ (‘God is Not a Saint’), part of the collection at the Magritte Museum. The other parts of ‘The Enchanted Pose’ are located in New York, Stockholm and Norwich. Brussels’ Magritte Museum, part of the Royal Museums of Fine Arts of Belgium (RMFAB), holds the most extensive collection of the artist’s work in the world. It is collaborating with the Centre of Archaeometry to determine what else might be hidden behind paintings in the collection using non-invasive physicochemical analysis and scientific imaging. 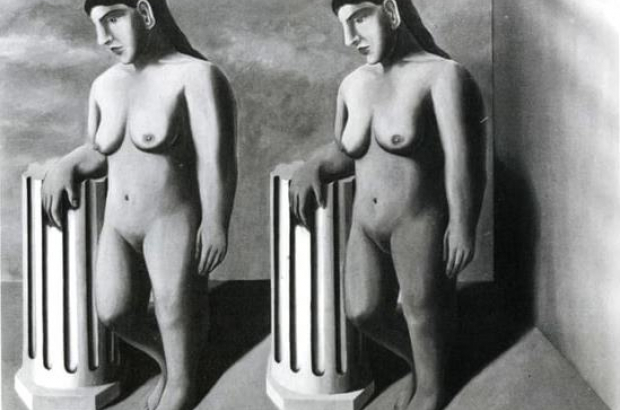 Meanwhile, a New York auction on Monday fetched the highest price ever paid for a Magritte work. Christie’s auctioned one of the three similar paintings called ‘L’empire des lumières’ (‘Empire of Light’) for $20.5 million (€17.5 million). Christie’s had estimated the painting at $14 to $18 million. The Magritte Museum also has a version of ‘Empire of Light’.